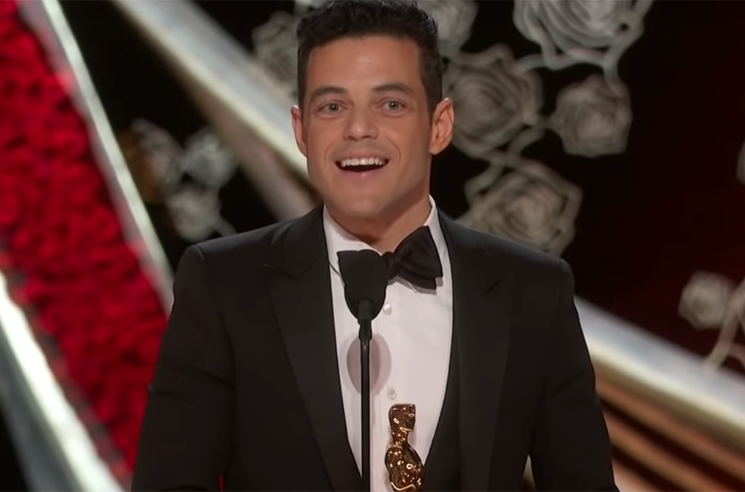 Rami Malek took home the Best Actor accolade at the Oscars last night (February 24) for his portrayal of Freddie Mercury in the Queen biopic Bohemian Rhapsody, but his glorious moment was short-lived. Following his acceptance speech, Malek took a tumble. According to multiple reports and play-by-play photos, the actor slipped while walking down the cascade of wavy black-and-gold steps back to this seat in the audience. A team of medics checked on him after the fall, but he did not require any further medical attention. Speaking to Entertainment Tonight after the ceremony, Allison Janney (who presented Malek with his award), said that Malek had successfully walked offstage with her after the segment and that "he was fine when I left him" — though she seemed relieved to know that he was okay. Watch clips of the fall and Janney's reaction below, as well as Malek's full acceptance speech.